Nine West is internationally known as a brand that creates and sells fashion-forward, stylish and affordable accessories and apparel to a very trendy demographic, as well as a very specific psychographic. 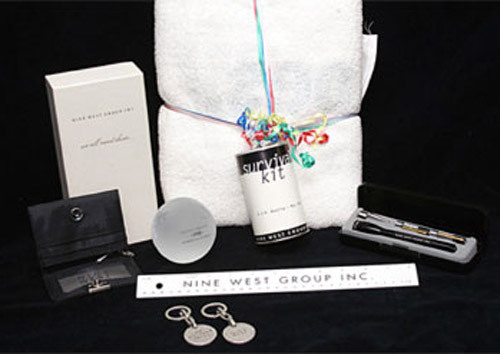 The young women who purchase Nine West products often expect a “Gift with Purchase” that is as exciting as the goods they are purchasing, along with a very high perceived value. Nine West Marketing employees are inundated with calls from suppliers, each hoping to win the opportunity to supply the next big “IT” item ~ our challenge has always been to conceptualize, create/source and deliver within budget, the next big “IT”. The Sourcentra Team looks back at what worked, as well as what did NOT work, looks at the current trends in the marketplace and scours through tons of forecast reports to succeed in finding the “IT” items. If a particular GWP is requested, we source “IT”, as well as provide alternative options, always staying within budget and offering added-value options such as storage, shipping and reporting to measure the success of each GWP program. Solutions in the Employee Motivation Program include: Pump Up the Volume *(winners receive anything from current CD’s or DVD’s to home theater systems), Perfect Your Serve…a program designed to encourage a more sincere and dedicated focus on servicing each client who enters a Nine West store *(even a Nine West “concept store within a store” at any one of the many department stores where Nine West owns a great deal of real estate inventory in the footwear, apparel and accessory departments). We have been so successful at satisfying the Marketing needs of Nine West, that we are often called upon to work with other divisions, most importantly the HR division that handles the Corporate Employee Motivation Programs. Challenges in this category demand “getting into the heads” of Nine West Employees to figure out what will encourage them *(other than their paychecks) to “LOVE” what they do and desire to become more involved with corporate initiatives, as well as to grow within the company.